Union Information & Broadcasting Minister Sh. 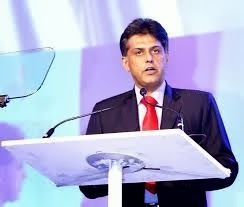 Manish Tewari has said that the UPA Government at the Centre has enacted various people friendly laws for the benefit of all sections of the society including the farmers. Addressing a large gathering at village Lohara of Ludhiana district today, he said now it is for the states to pass on the benefit of central laws to the people without any discrimination. Sh. Tewari asserted that development must be uniform and indiscriminate. He said that it is unfortunate that the states were presenting various welfare schemes like food Security Act, Pradhanmantri Gram Sadak Yojna and other similar schemes as their own. Sh. Manish Tewari distributed cheques of grant of Rs. 70 lakh from his MP’s Local Area Development Fund to the different village for the various development works and also lays foundation stones of various projects. Tewari said that his purpose was to properly distribute the money from his MPLAD fund across the constituency. Present on the occasion includes former MLA Jassi Khangura , DCCU President Pawan Dewan and Ashok Prashar Pappi.